Only in Mexico can the chief of a non-existent police force disappear but not be considered missing because he has yet to show up to confirm his non-existence. In one of the most violent cities in Mexico, that’s exactly what’s happened, with the municipal government unable to acknowledge the disappearance its own police chief. Not that it matters much, because Nuevo Laredo, directly across from Laredo, Texas, has no police force. It’s been two years since municipal officers patrolled the streets of this dusty, crime-ridden town. The state and federal governments, hoping to stem corruption, fired them all. They then brought in state police and the army to keep order. Citizens have been living in a state of siege ever since, waiting for the municipal officers to receive certification and get back on the job. How many people have since died and “disappeared”? No one knows, because Tamaulipas’ media has been cowed from years of violence and all levels of government have been dragging their feet, unable to even come up with a number. The city has now been without chief Roberto Garza Balmori for over a week. On February 17, his two brothers – one of whom was an agent with Mexico’s federal Attorney General’s office, the PGR – were found shot dead in the trunk of a car off the highway between Nuevo Laredo and Monterrey. Apparently they belonged to a powerful Nuevo Laredo family; their relatives have since left town. A municipal spokesperson, Juan José Zárate, said that the city couldn’t confirm that chief Garza Balmori had disappeared, only that he hadn’t shown up for work. And apparently the mayor of Nuevo Laredo, Benjamín Galván Gómez, concurred that he also can’t confirm the disappearance of the chief as long as he’s, uh, disappeared. That’s how it works in Mexico these days: if the police chief of a non-existent force isn’t around to confirm that he’s disappeared, then the government can’t really do much. After all, that’s the problem with missing people – they never show up tell you where they aren’t. Typically, the Mexican press has been under a cone of silence on this one, adding to frustration that Mexico’s chronic inability to address the issue of missing persons isn’t going to get better any time soon, despite government promises. 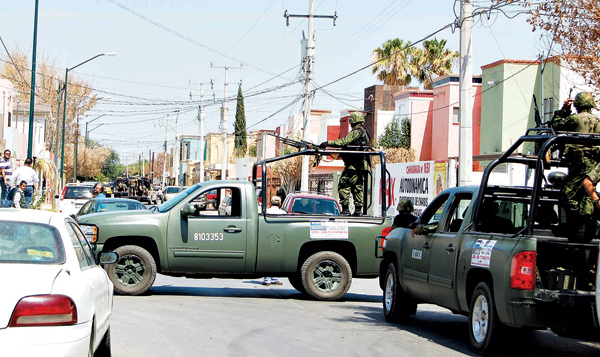 The city of 350,000 is a stronghold of the ultra-violent Los Zetas cartel, and has been beset by violence in the past two months. Los Zetas more or less did away with their former allies the Gulf Cartel a few years ago, but are now fighting an aggressive move by Mexico’s biggest and most powerful criminal organization, the Sinaloa Cartel. Apparently, Sinaloa allies from Michoacán – perhaps part of the new Corona alliance – are in town and “heating up the plaza”. On February 11 of this year there were explosions near city hall. Nuevo Laredo has a history of violence against security officials: in 2005, the police chief was gunned down on his first day on the job; and in 2010 a retired army general, who had been put in charge of police there, was also shot to death.